SINGAPORE - Shun Tak Holdings, a company founded by gambling billionaire Stanley Ho, has made its first foray into the Singapore property market. 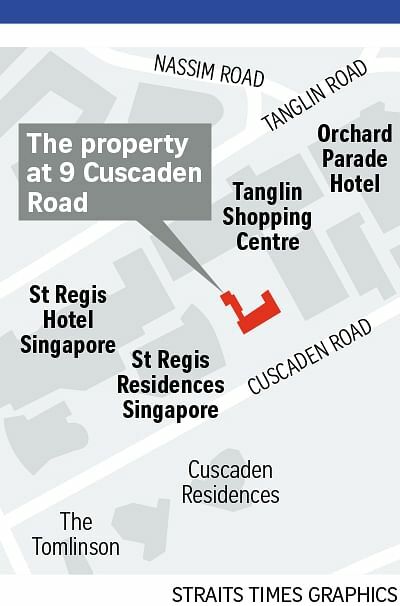 It is paying $145 million for 9 Cuscaden Road, a bungalow put up for sale by the descendants of famous philanthropist Tan Tock Seng. The sum, one of the highest ever paid for a landed house, works out to about $2,145 per sq ft per plot ratio for a hotel redevelopment, including development charges. The 25,741 sq ft freehold site is zoned for hotel use with allowable gross plot ratio of 4.2 but could alternatively be used for residential development as well, subject to approval. Shun Tak said it is at a preliminary stage of planning and will announce further details later. However, given the company’s expertise in hospitality, a hotel would be a perfect fit for the company, experts said. Shun Tak is firmly rooted in Macau’s tourism business, with operations including hotels, entertainment attractions, travel consultancies, conventions and exhibitions and transportation. Ms Pansy Ho, managing director of Shun Tak and Mr Ho’s daughter, said the firm would capitalise on its strength in hospitality and real estate development and “apply our experience in serving the demands arising from the burgeoning China and Asian markets”. Ms Ho is also co-chairman and executive director of MGM China Holdings and is said to be Hong Kong’s richest woman. The Cuscaden Road site was put on sale last month with an asking price of $160 million to $170 million. It was the family home of late business Tan Hoon Siang, who headed several rubber companies in Malaysia and was a great-grandson of Mr Tan Tock Seng. The land parcel was bought by the family in the 1950s. The house on the site is named Villa Marie, presumably in tribute to Mr Tan Hoon Siang’s second wife Marie Windsor who died in 2007.